My first introduction to Amy E. Reichert’s writing was a favorite story also set in Wisconsin and focusing on a life surrounded by food and friends (The Coincidence of Coconut Cake). I was so excited to have the opportunity to both read and listen to this story, I could hardly contain myself. And, fortunately for us both, I can say that BOTH versions kept me moving forward and engaged, wanting to know what was next, and imagining the scenes so aptly described that the scents nearly wafted through the house. 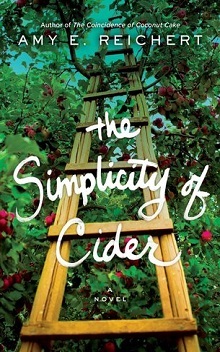 The story is built around Sanna, a fifth-generation cider maker, and quite content in her rather solitary life of tending the orchard and the press, much to the dismay of her brother who would prefer it all be sold. The orchard is again functioning at a loss, and while the orchard and the business are Sanna’s refuge, away from people who may ask more of her than she is willing to share, it is a burden on their aging father Einar, and his health isn’t the best. Enter Isaac and his son Bass: on a retreat from their home in California as Isaac wants to shelter Bass from his rather extreme and troubled mother and the fallout from her actions. While he’s intrigued with Wisconsin, this is simply a pit stop until Einar offers him a job, helping he and Sanna in the orchard and with the press. While their first introduction doesn’t go quite as smoothly as planned, surprisingly Sanna warms to Bass far sooner than Isaac. She’s got walls surrounding walls, and is near single-minded in her determination to keep the orchard alive, despite threats from vandals, her brother’s pushing to sell and her own self-doubts. Throughout the story, even as some threads do meander to nowhere, the gradual connection between Isaac and Sanna, influenced by their friendship and her relationship with Bass the importance of family ties and histories comes to the fore: with good and bad secrets and issues revealed and worked through, Gently winding to a conclusion with atmosphere, emotion and a sense of honest appreciation of the life lived on the orchard allow readers to curl up as if with a warm blanket and warm cider (or an apple cider donut), enjoying every moment. Narration is provided by Rachel Dulude and she brings Sanna to life clearly and simply – a brusque no-nonsense approach to her conversations that gradually softens in tone to show her own growth and comfort in the evolving story. Isaac and Bass also are clearly defined, as were the host of characters that appeared, never losing that sense of intention that the author wrote into the story, but never overworking an accent, affectation or emotion to the negative. Another wonderful story that demands you shut away the world and engage fully with it. A copy of this title was provided via Publisher via NetGalley, Tantor Audio for purpose of honest review. I was not compensated for this review: all conclusions are my own responsibility.